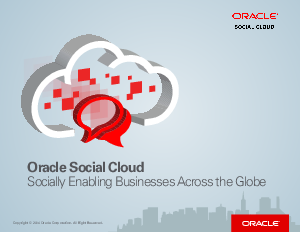 Did you know that 97% of business executives want social integrated across their enterprise? According to a recent Oracle global study, respondents nearly unanimously sang the praises of becoming a social business. Social gives you a window into the consumer like never before, revealing affinities that allow your business to understand and personalize engagements that build stronger customer relationships. communications; it’s embedded in their daily mobile and digital experiences.